67 loyalty points Your cart will total 67 points that can be converted into a voucher of 2,68 PLN. KNOCK YOU OUT OF 6 ADVANCED FORMS OF CREATINE! AS MANY AS 100 ANABOLIC PORTIONS IN ONE PACKAGE! A great combination of the most advanced forms of creatine, characterized by the highest anabolic activity and pattern of energetic changes. If you are looking for the perfect product cycle creatine - just any, found it! A huge anabolic strength in powder form! 100% legal and safe supplement. Olimp Creatine Xplode ™ to combine in a single unique product as many as 6 of the most popular and effective forms of creatine currently used in the world of advanced athlete supplements. The ingredients of this special product are appropriately balanced so that the release of free creatine molecules is highest immediately after the consumption of Creatine Xplode ™ very quickly fulfilling the demand for this compound under conditions of the greatest exposure to catabolism, after waking up and immediately after training. 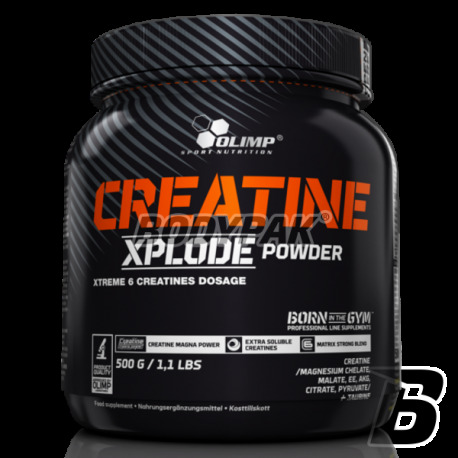 The Olimp Creatine Xplode ™ product include forms of creatine malate, ethyl ester, alpha-ketoglutarate, pyruvate, citrate, and a real "gem" in the group - an excellent creatine chelate of magnesium (Creatine Magna Power). The use of these high-performance forms of creatine guarantees more than the achievement of the aforementioned, the most diversified kinetics of the release of free creatine molecules, as well as minimum loss of this substance (into inactive creatine) under the unfavorable conditions of the gastrointestinal tract. Not without significance is the fact that the energetic metabolites of creatine (pyruvate, malate or alpha-ketoglutarate), after the release of its free molecule, feed the pool of substances included in a series of energy changes (including the Krebs cycle), directly contributing to a decrease in the subjective fatigue athlete. Very effectively it helps in the enrichment of Creatine Xplode ™ with taurine, which can synergistically acting very effectively influence the increase in the volume of training, clearly contributing to the improvement of sport performance while reducing recovery time. All these facts unquestionably put the latest OLIMP product in the lead, compared to traditional, one-ingredient creatine supplements. Olimp Creatine Xplode ™ is recommended for anyone practicing a sport, regardless of their current level. In any case, this innovative supplement will contribute to a distinct improvement in training performance and a noticeable shortening of body regeneration time. The beneficial effects will also supplementation of Creatine Xplode ™ by people every day, remaining in high physical activity, in connection with work or other responsibilities. Mixture used in the product 6 of creatine will give you a supply of strength for an entire active day. 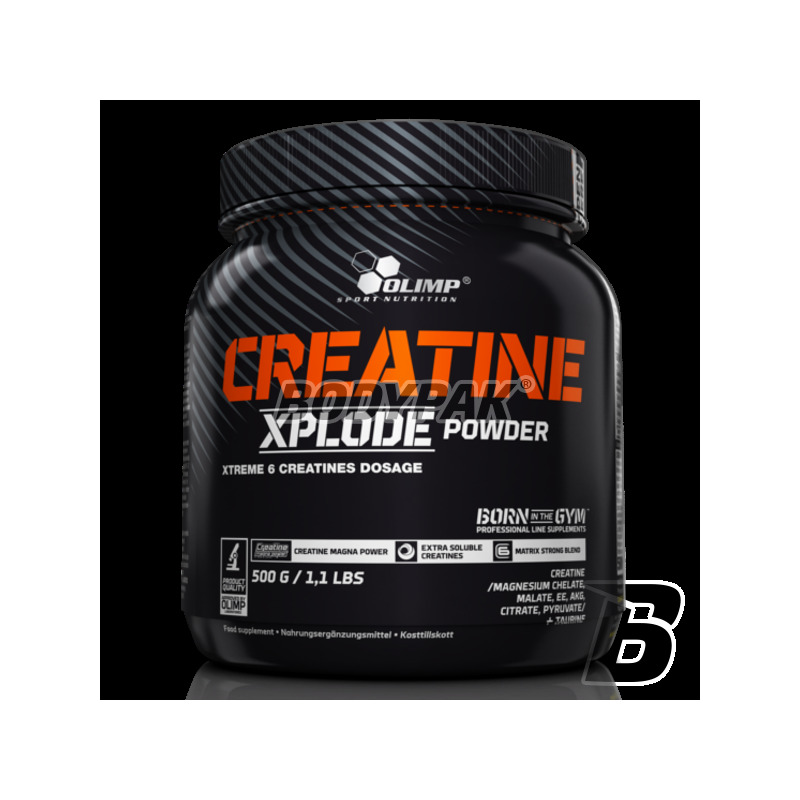 What products combine the best with Creatine Xplode? In order to maximize the growth of muscular weight this product should always be combined with carbohydrate supplement Carbonox, as well as protein supplements such. Mega Strong Protein or Whey Protein Complex 100% ®. In order to increase the effectiveness of your workout perfect addition (used before training) is AAKG 7500 Extreme Shot and BCAA Xplode. Perfect, anti-catabolic combination is pre and post workout supplementation GLUTAMINE Xplode and HMB MEGA CAPS. 1 serving daily before breakfast or after training. 1 portion (5g powder) dissolved in 125ml of water. Consume immediately after preparation. BioTech CreaTor - 120 kaps. Company BioTech USA has created what no one has yet been able to produce so far. In 2011, we combined the latest advances in research on creatine to create a unique multi-faceted product. Efficient and chemically stable form of creatine. High quality and purity of creatine hydrochloride powder - easy dosage and potency contribute to the rapid growth of muscle tissue! Bet on the quality!